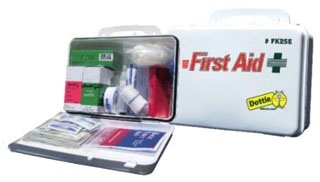 DOT FK25E FIRST AID KIT W/CASE | Springfield Electric Supply Co.
No office, vehicle, or worksite should be without this compact emergency First Aid Kit. The FK25E comes in a polypropylene case and includes all the supplies you need for up to 25 people. 1 Gauze Clean-Wrap Bdge. N/S 2"
1 Tri-Bndg. Non Woven 40" x 40" x 56"
1 Burn Gel 1/8 Oz. Pks 6 Ea.